Whether it’s activity tracking for Cancer treatment or reminder to take medicine, IoT, Internet of Things has brought to bear on healthcare. As we are moving towards a world which is more connected than ever, IoT is changing the game for most industries and healthcare is no exception. It will literally take over health in the next decade. With an expected market of $160 billion by 2022, global IoT healthcare will be more profound than ever. From personal fitness trackers to surgical robots, IoT is powerful enough to bring innovation and more efficient technology to the healthcare ecosystem. And healthcare being one of the largest industries of all, IoT healthcare solution will be breeding ground for maximum exposure. Having said that, there are still few setbacks in healthcare industry which demand attention. For instance, there is an overwhelming amount of data that is still unused by healthcare organizations. This not only increases the cost to that organization, but it makes patient’s life difficult as hell! There are still many untouched problems of healthcare industry which need a solution. That means we are still not using the maximum potential of IoT. Also, there an increased competition in the healthcare sector. More competitors are entering to leave a ‘global’ footprint which increases the cost of service. And hence there is a pressure to create better solutions resulting in a integrated healthcare. So, let’s find out the scope of IoT in healthcare, their possible challenges and bright opportunities in this article. It is clear that there’s no other field with more potential for IoT than healthcare. Since healthcare seeks to address a wide range of challenges – from rising cost due to old-school infrastructure to incompatible technology and fighting tough ailments – a smart technology is high in demand. IoT Healthcare solution is a proven catalyst for a strategic change in the industry. It will not only improve patient outcomes and efficiency but will reduce operational costs. With an intelligent IoT healthcare solution, an usage-optimized product integrated with the next wave of performance is possible. This includes enhanced medical imaging, at-home healthcare, real-time tracking analytics, seamless data sharing among patient and service providers, remote patient monitoring etc. IoT healthcare solution integrated with devices and smartphones can deliver brilliant healthcare experiences – which are precise, personalized and well-connected! Since IBM considered Industrial IoT to be the next big Economic Revolution in this post, many pieces of research have been done. Almost 60% of healthcare organizations have already integrated IoT by a study done by Aruba agency. 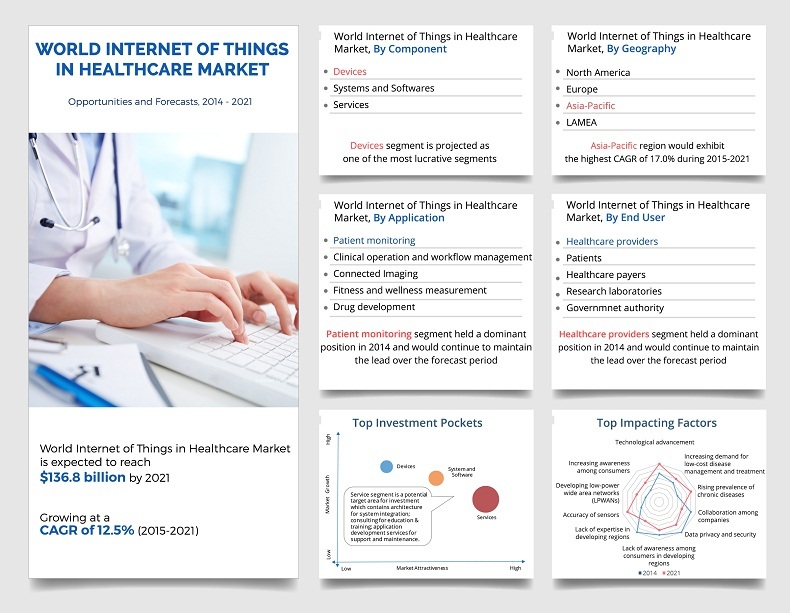 Another study by Allied Market Research suggested that the healthcare market with IoT is growing with a CAGR of 12.5%. The intermediary components will be intelligent enough to communicate within themselves without human intervention. 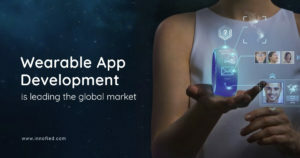 Being most popular in places like North America, Europe, Asia-Pacific and LAMEA, IoT healthcare will improve sectors like patient monitoring, clinical operations, connected imaging, workflow management and medicine development. After all these, there are few notable challenges. Internet of Things undoubtedly has the potential to help physicians with overwhelming data – which can improve their treatment. But there are certain limitations to IoT adoption in the healthcare industry. Since a lot of data is juggled with, let’s find out the possible challenges that may put things at risk. Healthcare organizations like hospitals, clinics and private healthcare bodies need to store personal health information. While a majority of healthcare organizations ensure that any kind of sensitive data is stored securely and is encrypted, none have a complete control over the safety. One mistake and data is open to a third party. Fret not – there are measures which can control this and reduce the significant threat to the device network. If a person has diabetes, chances are there that he is also suffering from heart disease. Now he has to use separate devices to monitor his diabetes and heart condition – which means multiple devices need to integrate to collect a group of data. And since there are different device manufacturers with their standard set of protocols, it can complicate that information grouping. This lack of uniformity reduces the success rate of IoT implementation in healthcare. It’s safer to talk about this while you are finalizing the IoT healthcare solution from a service provider. They will have the device data to integrate it right. Collecting an overwhelming amount of data is definitely a painful task and hence associated with complexities. Healthcare organizations anyway need to identify actionable and valuable data to proceed further. However, concluding to a result with a big amount of data creates hassles for them. And hence there is a lack of quality in decision making based on that data. So, it’s important to have secured IoT healthcare solution that refines data and analytics program. So, as you know there are challenges to any innovation, IoT is no exception. But by engaging brilliant minds, Internet of things can definitely overcome these hurdles in no time. 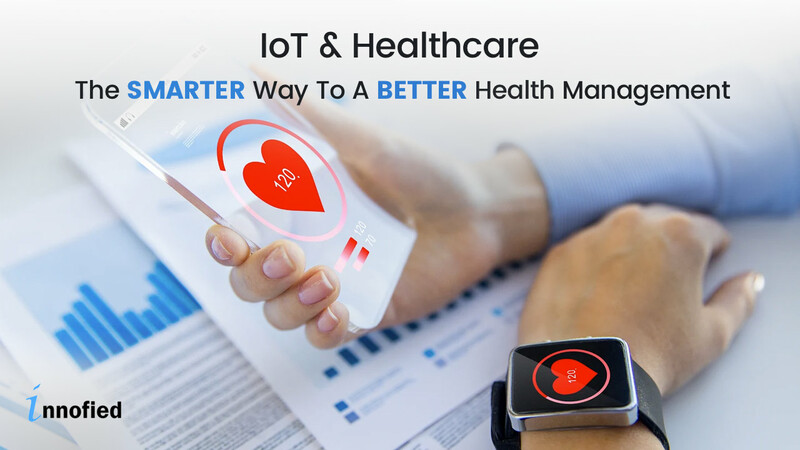 The only thing you need is understanding the requirement, decoding the idea and opting for an IoT healthcare solution that covers every problem area. So, it seems a majority of healthcare organizations can opt for IoT solution. And even startups who are looking to invest in healthcare can choose the right edges and invest. Let’s find the edges which can be transformed dynamically with IoT healthcare solution. Kickstart your IoT healthcare app idea with us! Every day, there are many patients who lose their lives in absence of timely prompt medical assistance. The distance of hospitalization can be one issue and sometimes there is no one present physically with the patients. And there are some people who do not get right medical attention to monitor their health or take their pills. So, remote health monitoring if done right can aid in faster healing in patients and also avoid fatal situations. Just imagine the situation where you can take care of the patient without being physically available there! Adequate healthcare gets possible to the patients who are in dire need of healthcare! But with the use of IoT healthcare solution, patient data can be collected remotely and further analyzed. It will be more proactive than relying on hospitalizations. There are remote patient monitoring solutions which collect vital health data in real-time. It will further generate alerts and in-app notifications which will let the healthcare provider know the patient condition – even when they are away from hospitals. So it seems remote patient monitoring solutions if implemented right can be a breakthrough in healthcare management. As it comes with wearable devices fitted with sensors, it will notify the concerned parties about the vital conditions. There’s an interconnected and secured database which stores medical records collected from different IoT devices. The information is hence easily available to the healthcare service providers like doctors and caretakers, reducing multiple forms fill-ups and data entry- from consumer’s end. There will be devices who will do the hard job of analyzing patient health and reduce their stay at hospitals. The moment when an interruption happens, the associated mobile app will send an alert to family members and health providers. Started with the technological advancements in equipment IoT in healthcare has evolved to a different level. In fact, it has gone trailing the corporate world almost by 10 years- and now have surpassed it! One of the greatest examples of IoT healthcare solution is the development of RLTS- Real-Time Location System. The system allows attaching an active or passive tag to the caregiver, patient, and equipment. While it can directly be integrated to ID card of the hospital staff, equipment, and IDs of patients. A major number of hospitals are using this to track staffs, patients, and devices. But how is it beneficial? transfer of patient and discharge etc. Hospitals can have gigantic productivity by attaching an RTLS tag to their wheelchairs and caregivers can find the closest through their smartphone app! It gives a complete access to control everything that’s happening in a hospital on their app! Now smart apps can track pretty much every device that is moving in the hospital’s perimeter. For instance, if a patient is waiting in a queue for more than 10 minutes, an alert will pop up in the caregiver’s app. Then he can check with the patient and do the needful. Also, hospital staffs can track all the medical devices, even they are kept out of sight. For a quality treatment in healthcare, we need a team of professionals – who can work closely with each other. And with IoT technology, creating a strong network of such professionals is possible. There will be a virtual network of doctors and physicians which is accessible through mobile apps. Internet of Things whether implemented in hospitals or private healthcare bodies can create a network of highly qualified professional doctors across the country. Patients can, in turn, get real-time advice and treatment right from their smart healthcare app. How convenient! One out of every 20 patients in the US suffers from infection in lack of hand hygiene, according to a research done by Centre for Disease Control and Prevention. And though there are hand hygiene monitoring systems, a good number of patients have lost their lives due to detrimental infections. But thanks to IoT healthcare solution- we can now get alerts whenever someone doesn’t maintain hand hygiene! How? The hygiene monitoring system works in real-time. If the caregiver approaches patient’s bed without his washed hands, the app will make the device buzz. And how will it detect? Well, hygiene dispensers have the RTLS (Real Time Location system) sensors. It will detect the entrance of the caregiver and if he uses the dispenser or not. That’s not it. All hand hygiene information is trackable – clinician’s ID and his location will be forwarded to the higher authorities! In particular, real-time health monitoring can cut down a lot of time visiting healthcare centers. Home care facility can significantly cut down on unnecessary hospital expenses and frequent readmissions. Also, patients can stay at their place and get monitored unless there is no serious illness. As there will be reduced errors, concerned healthcare authorities can deliver well-informed decisions. And since the treatment is proper evidence-based, it results in on-time and better results. Hence healthy patient is the major benefit of IoT in healthcare. See all of the benefits are interconnected just like IoT. Since the connected system with the Internet of Things emphasis on the exact condition of patients- the treatments are more proactive. Accuracy increases in diagnosis enhanced treatments and better intervention by physicians which results in high trust among patients. This also leads to higher trust in the healthcare organizations. So we have talked a hell lot about IoT in healthcare, it’s benefits and challenges. Now it’s time for some action! Let’s find some top-performing IoT healthcare applications that have taken a step ahead. IoT revolution has just begun. And it has already touched millions of lives! From startups to big brands, everyone is now in the race to build something better and ‘innovative’. 1. Ingestible Pill Sensors? Woah! After the first human trial of ingestible pills to track fart development in real-time, it’s time for another breakthrough! 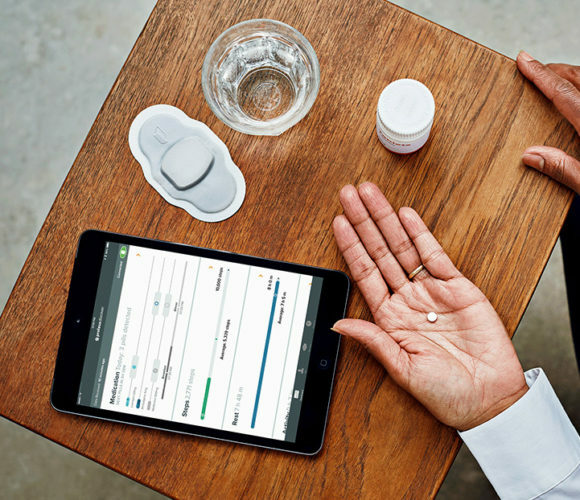 Proteus Digital Health has introduced ingestible sensors which can monitor adherence. The technology involves antipsychotics and a hypertension pill which picks up signals and send it to the smartphone app. The primary purpose of this IoT pill is to figure out if the medicines are taken on time. Adding sensors to medicine is not new with IoT healthcare solution. It gives the accurate data to doctors to track patient condition. And if they are sticking to their treatment plan. Novartis was working on the connected inhalers with Propeller and Qualcomm. The result? Propeller’s Breezhaler device is designed to passive record data and transmit the data on app. An interesting and useful technology to manage asthma and COPD than anything else. You can think of something similar and talk to your IoT healthcare service provider about the idea. 3. Fight Depressions With Apple Watch, Interesting Ain’t? Depression is one of the major problems around the globe with affecting about 400 million people. There are different ways to combat but Apple took a step ahead. Apple has always been the epitome of innovation. They recently collaborated with Takeda, one of the biggest pharmaceutical companies to develop the Apple Watch App. It helps doctors to analyze cognitive functions in patients who are suffering from depression. Connected IoT and wearables will gather active and passive data about the psychological condition of the user. Using this data, we can improve treatment procedure and help user can make better decisions. This is the future of IoT in healthcare. How cool is that? Worrying if all the innovative idea are taken and you have nothing left? Creativity never ends my friend! 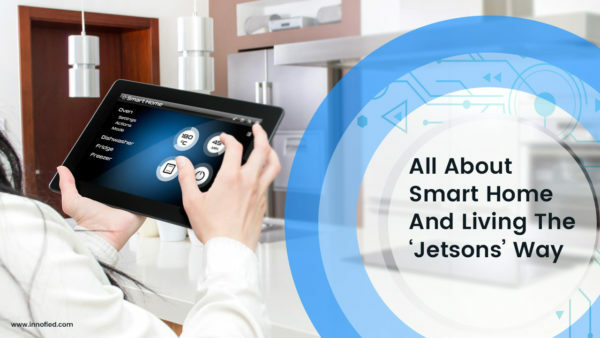 If you have a solid idea, you just need the right IoT app development team to give wings to it. So before you jumpstart, let’s find what things you need to keep in mind. Internet of Things is no child’s play. Your idea will need a bunch of actively working specialists to think over every possible detail. Nothing can beat experience and dedication to create a mind-blowing IoT product. Since IoT is ever changing, new technologies are coming up to build a connected network. While you plan to integrate new IoT system for your healthcare startup or organization, make sure you are discussing the latest IoT platforms with your developer. Most updated technologies include BeagleBoard Black, Raspberry Pi 2 and Intel UP Squared *Grove*. At Innofied, we have built enough experience to bring life to any of your IoT healthcare ideas. Be it software for clinics, hospitals or a new startup idea- we will understand your idea and brainstorm it to create a highly encrypted IoT healthcare solution. We will not only use a remote backup server to protect your product from malware. We tend to keep all your information stored in a place to keep it safe from getting lost. This is the greatest benefits of IoT driven connected healthcare service. Stuck With Wearable Technology? Here’s EVERYTHING You Need To Know!